Videogames and social media are connected like never before. 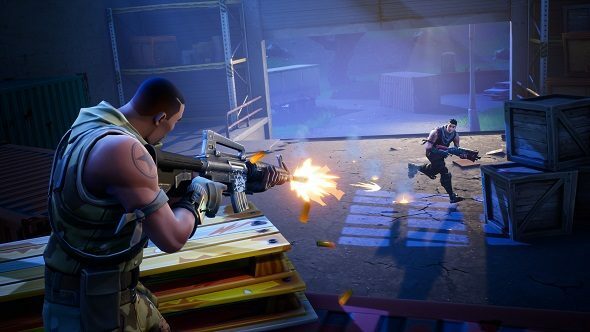 Whether it’s Fortnite Battle Royale matches attracting a million viewers to a single YouTube stream, snap-happy gamers uploading gorgeous screens to the likes of Imgur courtesy of Nvidia Ansel, or action-packed gaming gifs dominating Facebook and Twitter, it’s never been easier to share your favourite virtual moments with the world. Go back in time even five years ago and gaming was a much more solitary experience than it is today. Back then, taking screenshots or clips of your favourite PC titles was often a laborious process, requiring bespoke capture cards or complicated software. And even when you managed to capture a clip you were proud of, there were nowhere near as many online platforms to share your creations as there are today. Today, thanks to a wealth of simple-to-use, intuitive features that come with Nvidia’s GeForce Experience, there’s no longer any need to keep your favourite gaming moments to yourself. GeForce Experience’s Nvidia Highlights feature makes sharing killer headshots in PUBG and Fortnite Battle Royale, or a devastating combo in Tekken 7, absolutely worthwhile and effortless. Highlights allows players with GeForce GTX graphics cards to automatically capture and save clips of their most electrifying in-game exploits in an instant. Once you’ve activated Highlights in-game, you can then set it to automatically record the best moments from a round, or a match’s final, decisive kill. All you have to do to share your coolest clips is simply press Alt+Z while running GeForce Experience, go to the Gallery, and from there you can easily share, save, and delete recorded clips. Bandai Namco’s latest legendary fighting game now also supports Nvidia Highlights. Tekken 7 already boasts Nvidia Ansel support, allowing fight fans to effortlessly capture and upload high-quality Heihachi scuffles with the impressive 360-degree in-game camera. Now, with the addition of Highlights, Tekken lovers have even more ways to share their favourite fight clips. Next time you pull off Yoshimitsu’s Supreme Soul Stealer, make sure you share the essence-devouring moment on YouTube courtesy of Nvidia Highlights’ hassle-free capture functionality. Half a billion clips have already been recorded with Nvidia’s killer capture feature. The latest version of GeForce Experience makes Nvidia Highlights even more user-friendly, too. With the latest update, you simply press Alt+Z while in your game, select Settings, and then select Highlights. From there, you can toggle Highlights on or off, meaning there’s now one less barrier to uploading that juicy clip to your social network of choice. The latest version of GeForce Experience also brings another new feature that’s intrinsically tied to the culture of sharing game footage: gif-making. With this new edition, GeForce GPU-powered PC owners can now effortlessly make high-quality gifs, ranging from five to 15 seconds in length. This feature is compatible with both Highlights and ShadowPlay videos. To make a gif from your existing footage, simply open the clip by pressing Alt+Z, and then when you come to the Format option select Animated gif. From here, you can decide on where the gif starts, edit points of your gif, and change its length. When you’re happy with the final result, you can share your gif online on social platforms including Facebook, Google Photos, and Weibo. Who knows? You may have the next bitesized viral sensation on your hands. Uploading screenshots is an equally rewarding way to share your favourite gaming moments, and with Nvidia Ansel, over 40 titles currently have access to an incredibly powerful in-game camera. Star Wars Battlefront II recently joined that list, meaning you can now capture a host of stunning Stormtrooper shots in the game’s Arcade mode. Thanks to Nvidia Ansel’s robust feature set, you can capture screens from almost any angle, then add visual filters to alter the look and mood of your shots. Ansel works with GeForce GTX GPUs, and if you consider yourself a budding virtual photographer, the in-game camera gives you all the tools you need to capture and share some truly spectacular digital shots. With such a sophisticated photo tool at your disposal, it’d be a massive waste not to share those stunning in-game screenshots with the world. That’s where Nvidia’s newly launched Shot with GeForce comes into play. In the past, you may have uploaded your favourite gaming screens to sites like Flickr or Pinterest. With the new Shot with GeForce website, however, GeForce gamers finally have a place to share their screens directly with other gamers. Shot with GeForce is a great social space to view and share all those visually striking Ansel screenshots you’ve taken, and uploading your screens from GeForce Experience directly to the new screen-sharing site is quick and easy. Gaming has never been more diverse, interesting, or visually spectacular. There are now so many tools and places to share your gaming experiences that creating and sharing content is no longer reserved for the super tech-savvy. With such powerful, user-friendly features built into GeForce Experience, uploading great gaming screens, gifs, and videos is effortless, and sharing this content with others can lead to genuinely enriching social experiences. Take advantage of your games’ social functionality today by sharing your favourite moments with Nvidia Highlights, Ansel, and Shot with GeForce.